New petals are under construction! 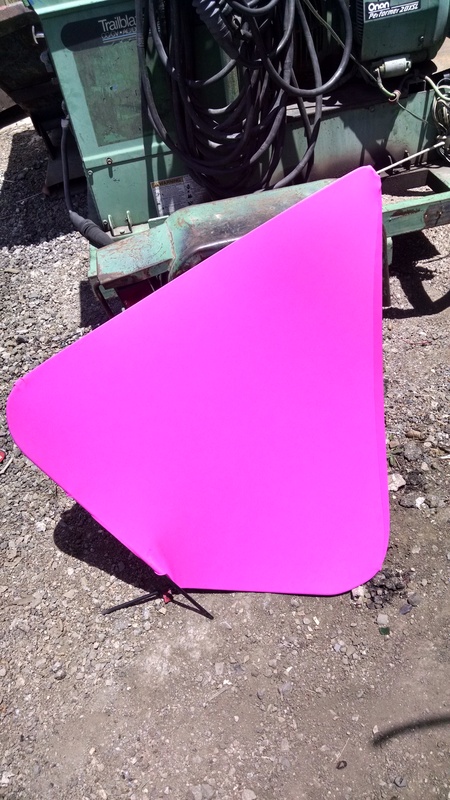 We cut and sewed our first test petal the other day with our good friends at Praxis, a wonderful local clothing store! I don’t think I’ve ever seen so much pink fabric at one time! We sewed them with a Serger machine, which will allow the petals to properly stretch and fit over the frames. 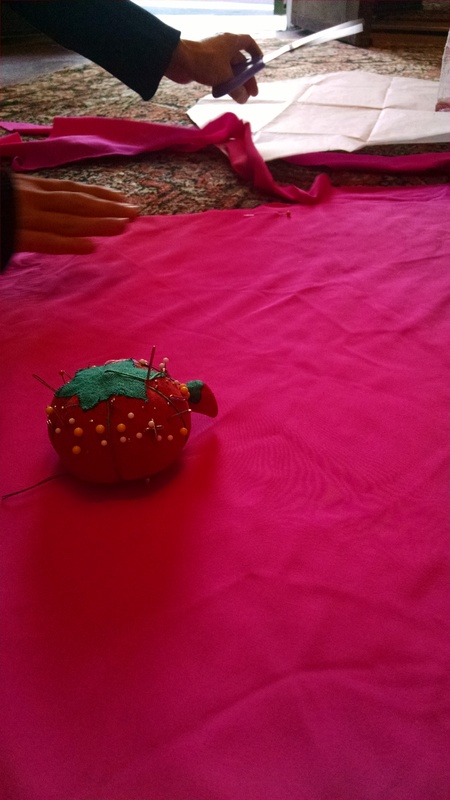 We decided to test out using velcro as a closure at the end of the petal so that the cover can still fit over the widest part. And they turned out amazing! 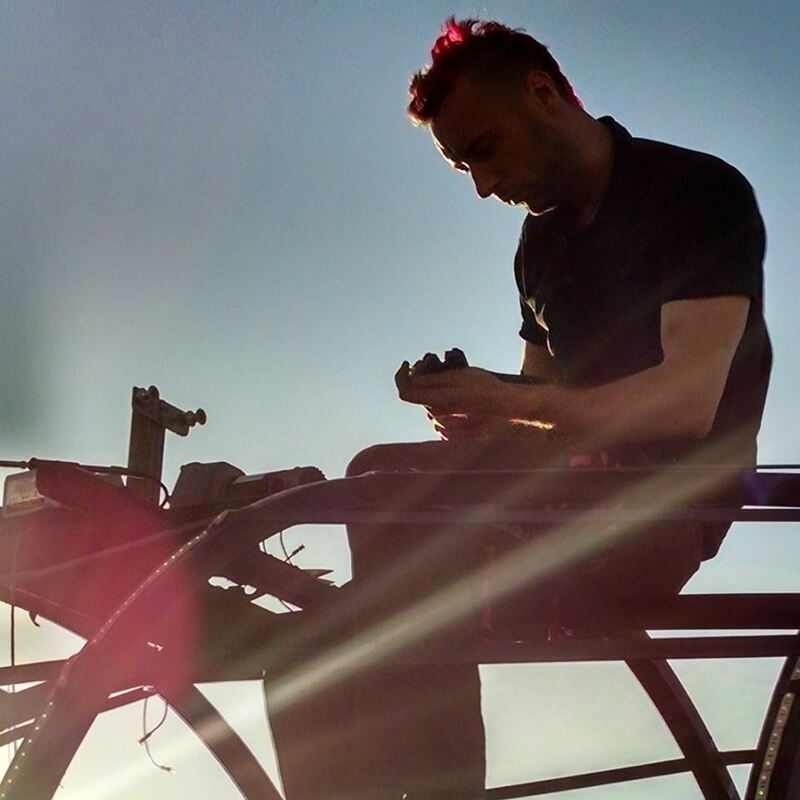 – We’ve already purchased lights, fabric, and motor parts, and are currently sourcing new ramps/other materials. We’re still hoping to rebuild the old motor by installing new brushes and should be testing out the ones we had made in the near future. Cross your antennae! -We’ve started work on all of your fabulous rewards! Materials are en route and we should be all set to get your gifts out to everyone by August! Two months until we hit the playa! See you all in the dust! Today was filled with little projects for Beezus. First, we sanded down his rusty bits and gave them a new coat of paint (he needed it!). 3 cans of black rust-proofing paint later and he’s looking pretty lovely. After that, we took apart all of the petals, which ended up being more of a chore than it sounded. Fabric is difficult to remove when it rusts onto something! But we did it! 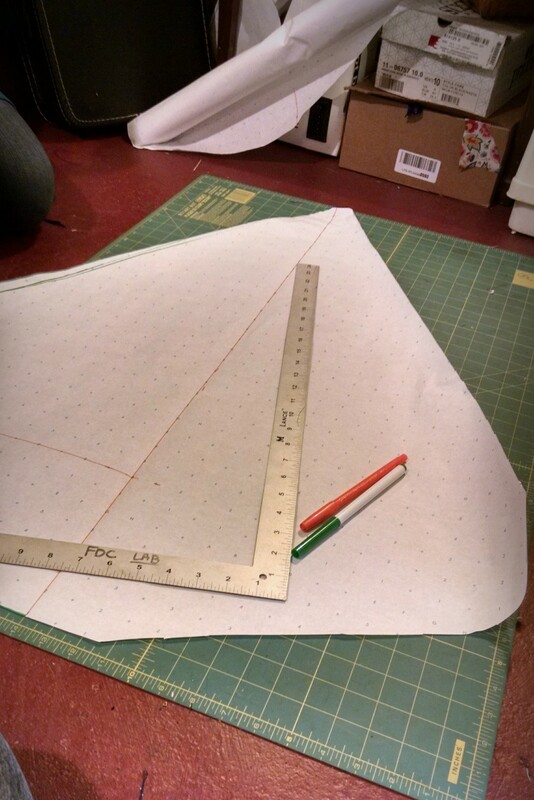 Afterwards, we measured out a lovely little template for the new petals we’ll be making. Take a peek! Now to order 12 yards of pink and purple spandex. Stay tuned. The time has come. 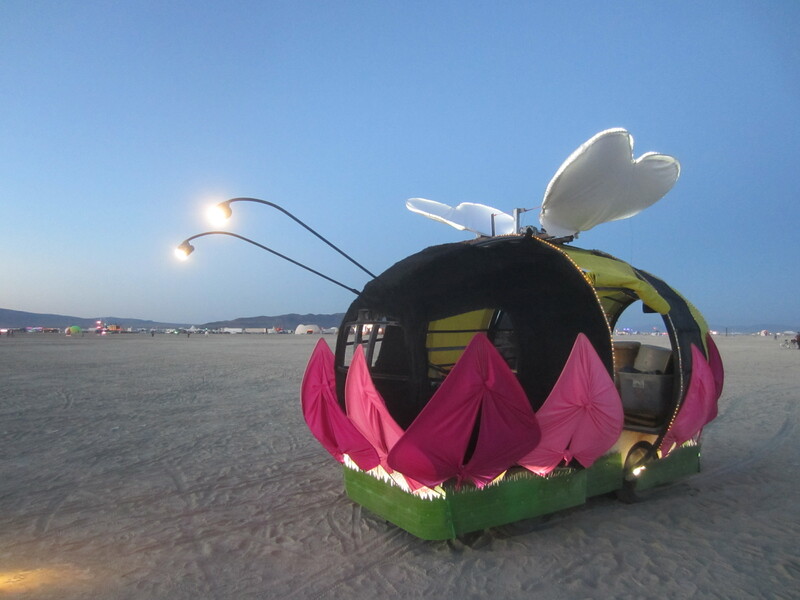 For the past 2 years we’ve been rocking Beezus on the playa. This year, we’re launching another Indiegogo campaign to help make him even better! 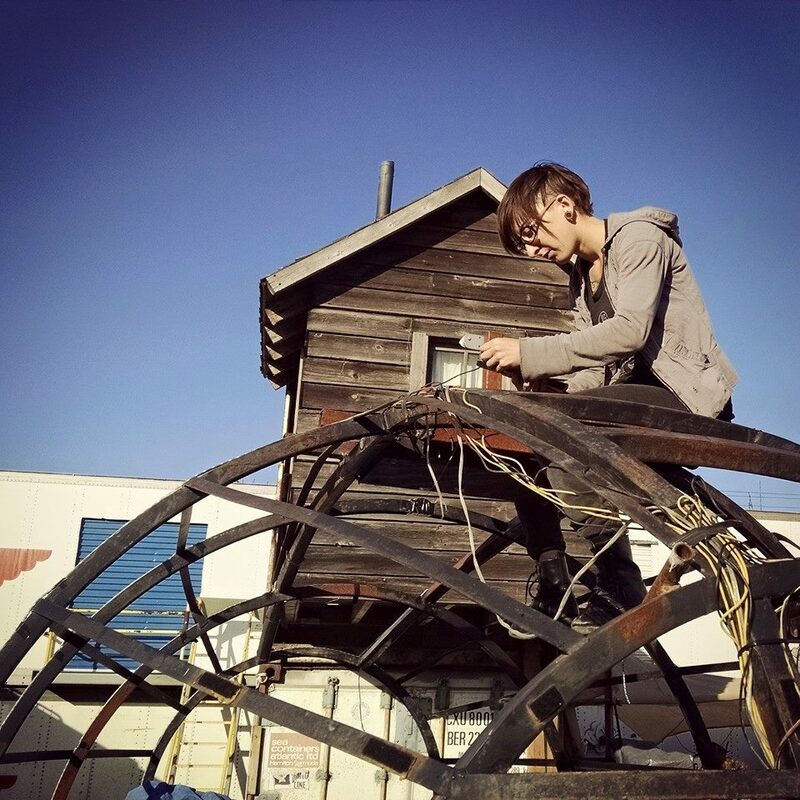 We’re re-doing all of the lights to fancy him up a bit, creating a second iteration of the flower petals, and doing some major repair work (see: new motor, drive system). And we need YOU to make this happen! SO check out our campaign. Donate if you can. Share if you can’t. Either way, let’s DO THIS! So as it turns out, even benevolent bee saviors can have health issues. A few weeks ago, Beezus suddenly stopped running. What to do?! Our first thought was that maybe his poor little batteries were tired. So we let him charge up for a while. No dice. The motor. We set to work taking it apart, and determined that the brushes had burnt out and broke, and that the commutator was past being salvageable. TIME FOR A HEART TRANSPLANT! 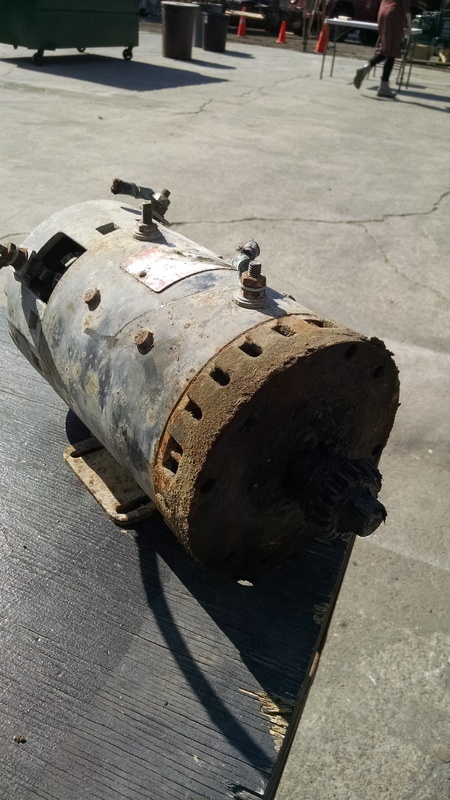 Fortunately the space where Beezus lives (NIMBY) can be a great place to find old parts, and SuperDave happened to have an old motor from another utility vehicle lying around. We just had to detach it from the axle. This actually ended up being more of an adventure than we had originally anticipated, but after a lot of tinkering and a lot of motor oil getting on basically everything, we managed to make it happen. Ta-Da! 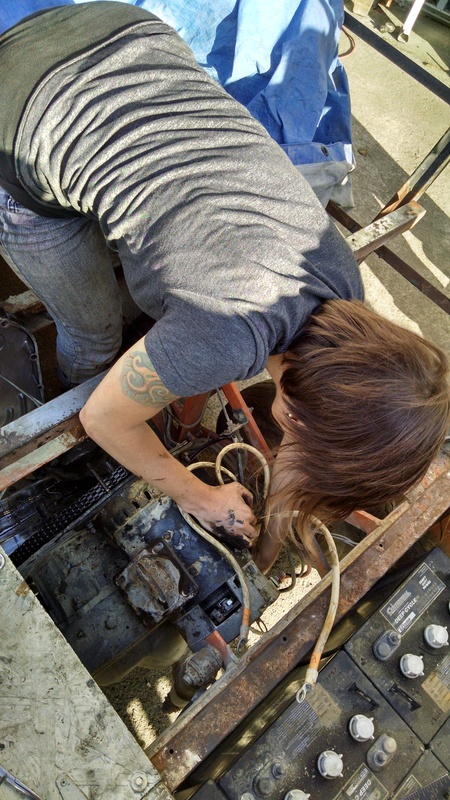 Then came the process of putting the new(er) motor in Beezus. The replacement was slightly bigger, so making it fit was a bit of a challenge. Then came the process of trying to fit the chain back on. We had hoped to do this without taking everything apart, but no such luck. So off came the brake drum and the casing around the chain. Lots more tinkering. Lots more oil. Lots more fun tools. Eventually, we got the motor in and connected! Then it was time to actually try to run the bee again. SO I pushed down on the gas pedal and… nothing. Wires were connected wrong. Oops! Tried again. AND IT WORKED! Sort of? We managed to get the motor running and wheels turning, but we ran into a slight issue. The new(er) motor had a bad bearing. Siiiiiigh. Well at least we’ll be ready for the next one! More updates on heart transplant number 2 here soon! We’re back to it! 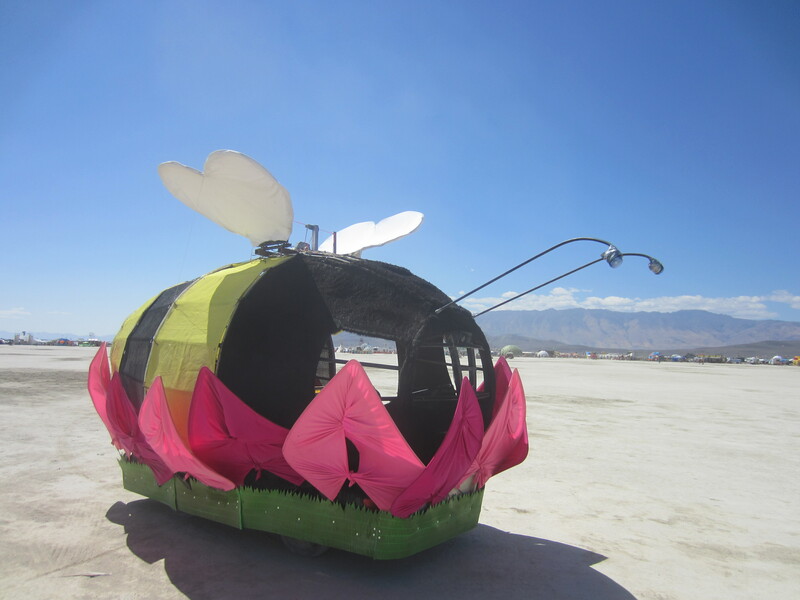 Beezus is out of hibernation and we’re buzzing along getting him gussied up for another year on the playa. Our first goal this year was to outfit him with new fancy lights. The past 2 years we’ve had simple rope light strands, so we figured it was upgrade time. We decided to go with RGB LED lights. We ended up going against individually addressable ones (they were a little excessive for what we were looking for), but they’re still programmable and will be doing some lovely color fades! The stripes, flower petals, and grass will all have lights that will add a whole new dimension to our lovely little bee. Here’s some shots of the process! Oh, and stay tuned for lots more! We’ll be ramping up a new fundraising campaign here soon! Beezus, that was a good one! It’s been a week since we’ve returned, and the dust is finally settling. 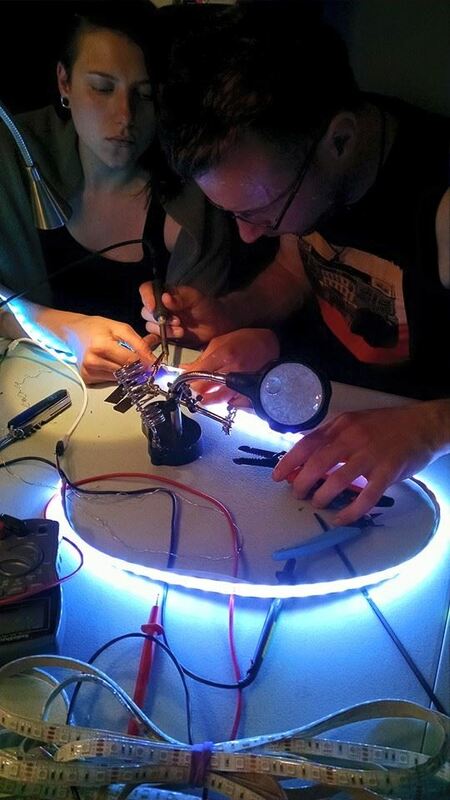 Thanks to our Indiegogo supporters, we were able to give him a fancy new flower, a sound system, and flapping wings! We served more honey than ever this year, and Beezus buzzed around like a champ. He was even a witness in the wedding of a few wonderful friends from the Bay! We can’t wait to make him even better next year. As of this morning, the Indiegogo campaign for Beezus is officially up and running! In true Burning Man fashion, we’re totally late to the party. But check it out! Watch the video, take a look at our sweet rewards, donate if you can, and share with your friends. let’s make this year even better than the last! Sooooo it’s super last minute, but we’re throwing an impromptu fundraiser this coming Thursday, June 19th at F8 (1192 Folsom) here in San Francisco from 9 to 2! About a week and a half ago we were offered the date, so we figured what the heck! It was so much fun last year! We’ll have music, Beezus swag, and honey drink specials for you. ALL for only $5! Come get silly in the name of Beezus! Precompression was a great success! Sweet Beezus. What a night. Smiles for miles over here. We rolled into NIMBY at 3 and got Beezus all prettified and placed just in time for doors. 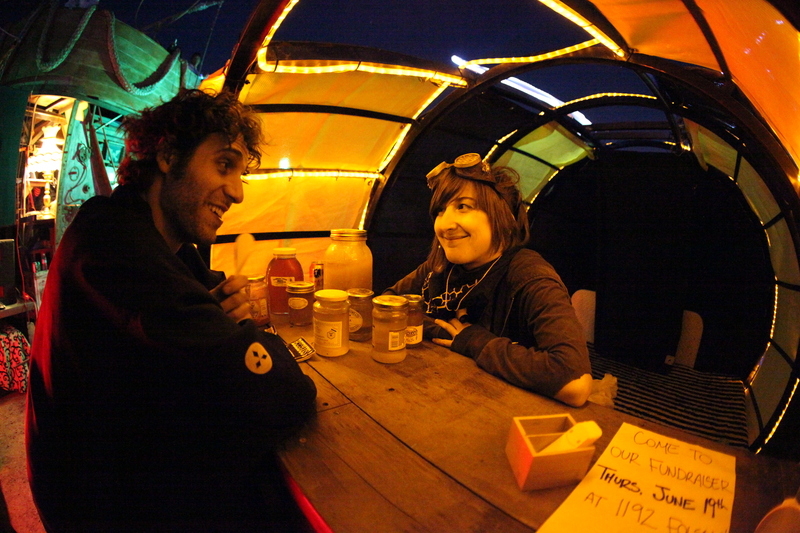 The honey bar was stocked and we were so excited to share with all of you lovely people. What a success! We might so many wonderful new friends and shared our honey from around the world! San Francisco local honey was a favorite once again, and Morocco was a super big hit with it’s distinct flavors. We literally had people coming up saying that people told them to try the Moroccan honey! I can’t believe how much we went through. 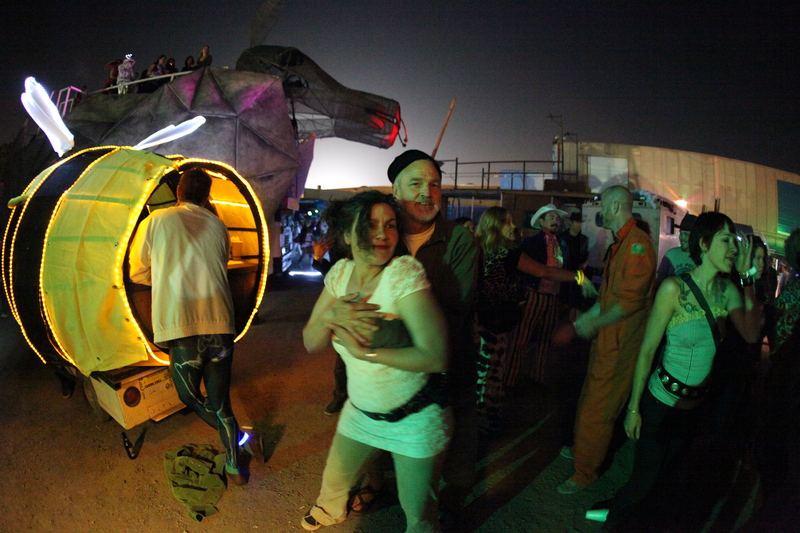 So ready to do it over and over again on the playa though. Enter your email address to become a follower of Beezus!